The football team didn’t make a bowl game, the fanbase is apoplectic about the head coach being retained, the much-ballyhooed new offensive coordinator left before coaching a single practice and the athletic director banned the Song Girls from basketball games without much explanation. So thank goodness for the incoming freshman wide receiver class, a badly-needed reminder that the Trojans can still achieve something at an elite level and, more importantly, what must be done for that level of excellence to standardize across the board. 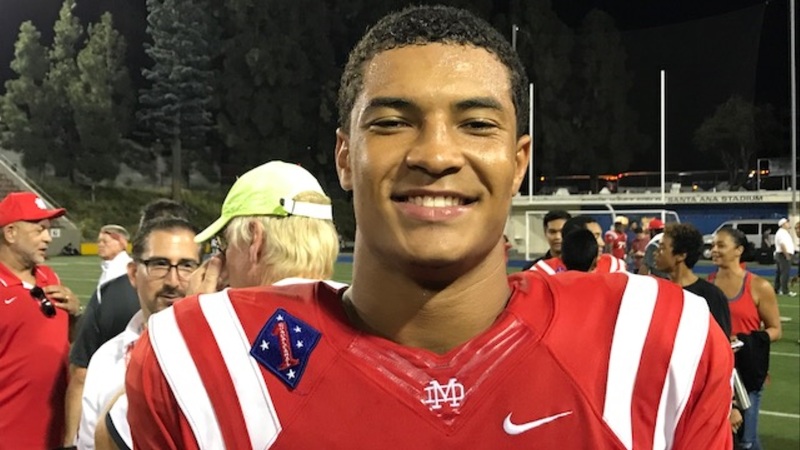 Bru McCoy headlines USC’s 2019 WR class. Nationally, the five-man unit of Bru McCoy‍, Kyle Ford‍, Puka Nacua‍, Drake London‍ and Munir McClain‍ is rivaled only by Oklahoma. At USC, it’s indisputably the best wide receiver group since the six-player haul from 2016 that was headlined by current starters Michael Pittman Jr. and Tyler Vaughns. All five stand 6-foot-2 or taller. Four of the five are four- or five-star recruits. Coming out of high school, they are exactly what a Trojan position group should like in a time when USC has only secured a handful of such groups over the Clay Helton era. They are the intended natural order of things. And, this year, they are the outliers. By now, it’s fait accompli: A substantial chunk of the 2019 recruiting class will disappoint relative to expectations. None of this is likely news to you, not if have a rudimentary understanding of how the ubiquitous star system works and certainly not if you subscribe to this website. Consequently, there’s no point in rehashing the “how” of it all. You’ve already heard it. What does matter, though, is why the receiver group has flourished amidst program-wide disappointment. It isn’t as simple as the promise of abundant playing time. Barring any transfers or medical retirements, the Trojans return 100 percent of its wide receiver production from last season. Nor does it have anything to do with talented recruits spotting an opportunity to leapfrog less-talented upperclassmen, given that every receiver who caught a pass in 2018 was a four- or five-star recruit, including a pair of five-stars in last year’s recruiting class. And they certainly aren’t coming to shock the world, as so many recruits pay lip service to doing, since USC has consistently bagged top-tier receivers this decade, beginning with 2010’s five-star trio of Robert Woods, Kyle Prater and Markeith Ambles. There are no contextual charades to play here, in other words, no upselling an opportunity or a narrative to overcompensate for some inevitable lack of development once those players enroll at USC. Simply put, no one stacks that many elite recruits year-over-year at the same position unless it’s on the strength of genuine results from beginning to end. That process starts with a position coach who recruits, in the most dogged sense of the term. It means pounding pavement year-round, not only to unearth gems but to incrementally build relationships with them through sustained communication. Outgoing receivers coach Tee Martin was a master of each. The former is how the Trojans, in a rare case of pursuing a lower-tier prospect at this position, nabbed Deontay Burnett on a blueshirt after Martin zeroed in after untold hours spent at Gardena’s Serra High School. The latter is how, just last year, the Trojans surged from behind to sign Devon Williams, to say nothing of the way it enabled Martin to recruit somewhat outside his position group and sign an all-world prospect like Adoree’ Jackson in 2014. It continues once those players are on campus with ongoing, dependable growth. Player development isn’t always linear, mind you. Darreus Rogers, for instance, had a strong freshman season and regressed slightly in the middle part of his Trojan career before ending his USC tenure with a standout senior season. But the bust rate at wide receiver in recent seasons has been fairly low relative to other positions, especially among players who haven’t gotten injured or left the program. From All-Americans like Woods to all-conference contenders like Pittman and Vaughns to valuable role players like Rogers, USC has regularly cultivated a receiving corps that plays to its lofty billing out of high school – not just because the Trojans signed players with the raw ability, but because Martin knew how to mold it. JuJu Smith-Schuster was the most recent receiver to move from USC to the NFL with great success. The next step comes at the next level. The names speak for themselves: Robert Woods, Marqise Lee, Nelson Agholor and Juju Smith-Schuster. All four not only were drafted by NFL teams but are in the early stages of standout careers. Smith-Schuster, at 22, is a Pro Bowler, Agholor has a Super Bowl ring and Woods is on the cusp of joining him. Prior to this year’s knee injury, Lee was the top receiver on a Jaguars team that made the AFC Championship game last season. The pro game is its own animal, one in which scheme fit and individual personalities play such a decisive role in a player’s success that it would be unfair to credit or blame college programs for too much of their results. Still, there is no equivocating when it comes to that group. All a Trojan recruiter has to do is rattle off those four names and the pitch is implicit: USC puts wide receivers in the league and those players stand out. The success trickles down from there. Identify premier talent. Recruit it. Develop it. Send it off to the next level, where, if you’re doing things right, some of it should succeed. It sounds simple. For a school of USC’s stature and resources, it should be, too. But, aside from quarterback, some aspect of this has been difficult for virtually every other position group. Until Adoree’ Jackson, USC struggled for years on end to sign upper-tier cornerback talent. Nine of the Trojans’ 11 returning offensive linemen were four-star recruits out of high school, a fairly typical ratio in recent years. But the Trojans have routinely failed to polish them to their full potential, to say nothing of actually getting those players drafted. USC signed four- and five-star running backs for eons yet Reggie Bush was the only one this century who amounted to an above-average starter in the NFL, which in itself was a minor disappointment given his generational talent. On and on it goes. There is much work to be done, up and down the roster. With Martin gone, it falls on Keary Colbert to ensure that wide receiver doesn’t become one of those problem areas. For now, though, they remain the roadmap for how to fix so much else that ails the Trojans. The future out wide remains indisputably bright. This year’s freshmen are the five latest rays.